Metal or Wood Bat? Let History Help You Decide! Now that the BBCOR rules have changed the way metal bats can be made, many kids are switching to real lumber - that's what the pro's use, after all! Other young ballplayers just aren't so sure. They may have been using a metal bat for years and are hesitant to try anything "new." 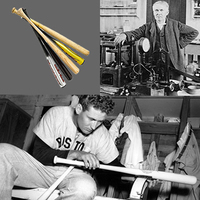 There's a great two part article I read more than a month ago by Tom Swyers that looks at the lives of Thomas Edison and Ted Williams, using the experiences of those two standouts in their respective trades as an answer to the Great Bat Debate. It's a wonderfully nostalgic trek that may not solve the dilemma for everyone, but it sure is a great read! In Part I: The Connected Lives of Thomas Edison and Ted Williams, Tom talks about the achievements and work ethic of both Williams and Edison. While neither could have done what the other did, they both understood what it takes to be a winner. Like Edison, Ted Williams is regarded as one of the very best his profession has ever seen. Numer seven all-time for career batting average, Williams also knew that he was going to fail far more often than he succeeded in the batter's box. That only made him try harder. "If I was being paid thirty-thousand dollars a year, the very least I could do was hit .400." "A man has to have goals - for a day, for a lifetime - and that was mine, to have people say, 'There goes Ted Williams, the greatest hitter who ever lived.'" In " Part II: Lessons from Thomas Edison and Ted Williams: The Great Bat Debate," Tom Swyers provides some statistical data on how the BBCOR rules for metal bats have brought batting averages back to what they were before aluminum bats were first introduced to the game of baseball in 1974. He also shows why wood bats give a hitter a better chance of making solid contact with the ball. Then, Tom picks up where he left off with the two historical greats. This time, he discusses why both Edison and Williams may have ultimately decided to choose a wood bat over a metal one. Tom talks about how important confidence is to a hitter and how Ted Williams treated his bats like gold. Williams was very particular about his bats and could tell when he picked one up whether it was a good bat or not. The confidence in knowing the bat would not fail him gave Williams an edge and he actually credited Louisville Slugger with much of his success. A lot of this article is about the wood bat manufacturer, Southbat, and the scientific approach they take to getting the very best wood for the bats they make. Thomas Edison used a similar scientific approach, testing substance after substance to use as a filament in his light bulbs. Scientific data supports the fact that metal bats offer no advantage over wood bats and that wood bats deliver more power at the barrel head. Statics show it, too! If nothing else, this article should convince you to give a quality wood bat a try. Both Williams and Edison never stopped trying new things. Be sure to check out our article, "Tips for Buying a Wood Baseball Bat" before buying one, though.